Black Paper Flowers. 40/pack. Mix of 3 different sizes. Approximate sizes are 2.5 inches, 2 inches, and 1.5 inches. Paper flowers are a quick embellishment for scrapbooking or card making. 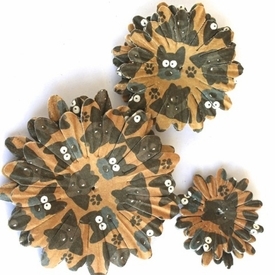 Paper flowers can be used with our matching brads. 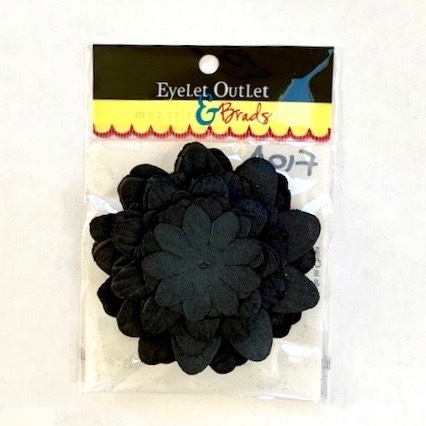 Layer Eyelet Outlet flowers for a dimensional addition to paper crafts. Our paper flowers are easy to use embellishments and add a pop to hand made birthday cards & invitations. A great value with 40 paper flowers to a package. Our paper flowers look wonderful with our jewel brads as centers. Paper flowers are a fabulous addition to scrapbooking pages and hand stamped cards. 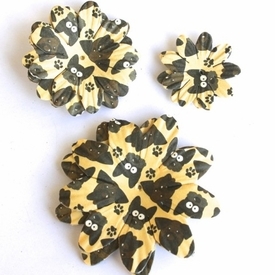 Paper flowers are a quick and easy to use embellishment. 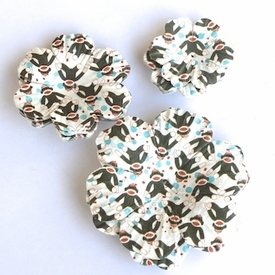 Paired with our round brads these paper flowers will add flair to your craft project. 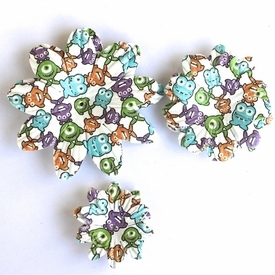 Overlap the three size paper flowers and secure with a pearl brad for a fast scrapbooking and paper craft embellishment.